"(O)ftentimes when readers, um, disagree with our work and very passionately disagree with us, they disagree with us using evidence that we gave them. It's not like they're going out and researching these things and uncovering these facts." Producing oil was not one of President Obama's priorities early in his presidency. He preferred to ramp up the use of renewable energy sources while allowing the price of oil and other carbon-based energy sources to rise. The rise in cost would help encourage the use of renewables. As gas prices rose and Obama faced tougher prospects for his re-election, he started to make claims about oil production in order to co-opt Republican calls for more domestic drilling. Here we'll examine the way PolitiFact treated a closely-related set of oil production claims over approximately the past year. There's little dispute about the facts. Domestic oil production is up. But things get a bit murkier when one starts trying to assign credit. And that's precisely where PolitiFact flubs this series of fact checks. So Obama is right that American oil production is at its highest level since 2003, but we’re taking the statement down a notch on our rating scale because the amount is projected to fall during each of the next two years, making it somewhat problematic to use the number as evidence that domestic oil production is on a healthy trendline. On balance, we rate the statement Mostly True. Importantly, this rating occurred prior to PolitiFact's commitment later that year to including the assignation of credit or blame in its considerations. This story did not take into account Obama's implicit claim of credit for enabling increased oil production. Obama was correct when he said that "right now, American oil production is the highest that it’s been in eight years." We think he may have overstated his administration’s role in achieving that, but not wildly so. We rate the claim Mostly True. Since PolitiFact did no apparent investigation of the President's role in achieving higher oil production, one wonders how PolitiFact arrived at the conclusion that Obama did not wildly exaggerate his role. The story offers no objective data on which to judge Obama's role in oil production. Obama’s commercial is accurate in saying domestic oil production is at its highest level in eight years. The suggestion of the ad, however, overstates the administration’s role in achieving these results. Much of the increase in production during under Obama has come from state and private lands that the president does not control. So we rate the statement Mostly True. PolitiFact said that "much" of the increase in production occurred on state and private lands, right after reporting that production on federal lands dropped by 83 million barrels in 2011. Doubtless PolitiFact tried to give Obama credit for higher production from federal lands in 2009 and 2010. In general, from purchase of the lease to first production can take anywhere from 7 to 10 years in areas that have existing infrastructure. The API says lease development ranges from three to ten years for onshore sites. Obviously extended delays occur between the granting of a lease and the production of oil. Based on the above, we have good reason to wonder whether any leases granted by the Obama administration have resulted in commercial oil production. If Obama can't claim oil production from leases granted through his administration, then what claim does he have on increased oil production through this stage of his presidency? Why is PolitiFact willing to offer Obama credit without supporting evidence? As a result of PolitiFact's refusal to thoroughly examine Obama's underlying arguments, we have three instances where a superficially true statement was used to encourage the false impression that the Obama administration increased domestic production of oil. PolitiFact offers seals of approval to that message with only minor caveats. The last fact check in the set does not match the others. The claim comes from Crossroads GPS, a conservative PAC associated with Karl Rove. PolitiFact rates it "Half True," and the rationale behind the rating beckons for an examination. The ad starts with Obama’s claim that domestic oil production is at an eight-year high, something we’ve twice rated Mostly True. Then a narrator asks: "Oh, really? His own administration admits production's down where Obama's in charge." The context: an Obama claim of an eight-year high in domestic oil production. The ad's riposte is devastating. If production is down in federally-controlled areas then it exposes Obama's claim as a trumped-up piece of misdirection. As noted above, Obama can't claim credit for the overall increase in 2011 if production is down on federal lands. That means that the eight-year high comes from increases on state and private lands. This ad focuses on Obama’s role in domestic oil production on government land. We’re evaluating the claim that the president's oil "production's down where Obama's in charge." It gets worse. PolitiFact proceeds down a lengthy rabbit trail dealing with oil production averages, comparisons with oil production under Bush and suppositions that the Crossroads GPS ad implies that oil production on federal lands is on a general decline. In short, PolitiFact ignores the context and conjures up some straw men. A Crossroads GPS ad says Obama takes credit for Bush-era policies, then blames him for a downturn in oil production on federal lands. While it’s true that the effect of a president’s policies don’t show up in oil production for some time — in some cases, decades — the ad goes too far when it cites a 14 percent decline in production in a single year as evidence of the impact of Obama's overall energy strategy. The ad says oil production's down where Obama's in charge." The facts show that the decline represents a single year that followed years of substantial gains and occurred only offshore in the wake of a major oil disaster. The ad’s statement is partially accurate but leaves out important details and takes things out of context. We rate it Half True. The ad's statement is entirely accurate and leaves out no important details. Given the decrease of domestic oil production on federal lands for a year in which Obama takes credit for an eight-year high in domestic oil production, logic demands the conclusion that Obama does not deserve the credit he claims. That's the point of the claim in the ad, period. There's no good reason to call it anything other than "True." Who gets the credit for increased oil production? Improved technologies for recovering oil from oilfields deserve the greatest credit for increasing oil production. If either Bush or Obama deserves any credit beyond that, it is Bush. It isn't likely that any oil leases granted by the Obama administration have started commercial production of oil; certainly the bulk of leases showing commercial production in 2011 are likely from the Bush administration. PolitiFact reported the delay between a lease grant and commercial production yet missed or ignored the obvious implication. The chart below helps make clear that an increase in domestic oil production on state and private lands accounted entirely for the peak figure for which Obama claimed credit. State and private lands accounted for more domestic production in 2011 than for any other year on the chart. How did PolitiFact slip up so badly? Ideological bias may well play a significant role. Simply asking commonsense questions about oil production ought to have led to the conclusion that Obama could claim no real responsibility for increased oil production in 2011. PolitiFact glossed over key facts in its reporting on all four versions of the oil production story, giving Obama undeserved credit in each case for a relatively good year of oil production and flatly ignoring the context of the Crossroads GPS ad. PolitiFact distorted the truth in each instance. PolitiFact serves as an unsatisfactory substitute for competent fact checking. Clarification 4/18/2012: In the section dealing with the March 28, 2012 PolitiFact item, changed "after reporting that production dropped by 83 million barrels in 2011" to "after reporting that production on federal lands dropped by 83 million barrels in 2011." Deleted the first occurrence of a sentence appearing twice in the post. 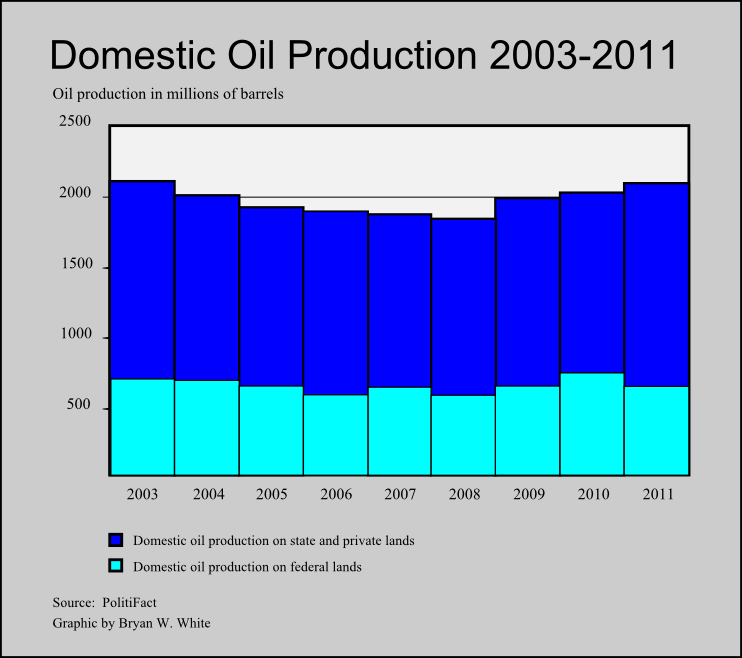 Clarification 4/20/2012: Changed "an increase in domestic oil production accounted entirely for the peak figure" to "an increase in domestic oil production on state and private lands accounted entirely for the peak figure." Sen. Bill Nelson has budget crisis licked?